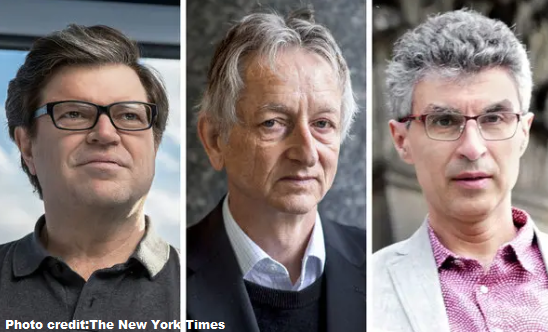 Today, in this blog, we would talk about the three researchers from A.I (Artificial Intelligence) Yann LeCun, Geoffrey Hinton and Yoshua Bengio. They have been working on the key development of the neural networks, which are reshaping how the computers are built. At San Francisco, in 2004, Geoffrey Hinton put his effort on the technological idea which was the ‘neural network’. It’s nothing but a way for machines to see and visualize the world around them in quite different perspective. Like to recognize sounds and even understand natural language. But scientists were working hard, spending their time building this machine for more than 50 years on the concept of neural network but the invention couldn’t do any one of the given condition. To boost up the effort….. The world’s largest society of computing professionals, the Association for Computing Machinery, declared on Wednesday that Dr. Hinton, LeChun and Bengio won the Turing award, which was introduced back in 1996. The reward is also referred to as nobel prize of computing which includes $1M+ which the three scientists will share. And, now at present Dr. Hinton works for Google, Dr. LeChun for Facebook and Dr. Bengio has inked deals with IBM and Microsoft. Now talking about neural network, it’s a complex mathematical system which has the ability of learning discreet tasks by analyzing vast amount of data. For example, it can learn talking by analyzing 1000+ old phone calls!! The benefit is A.I is boosting ahead covering so much of development which was not possible in the past. Dr. LeChun tried to make a neural network which could read handwritten letters and numbers, like the captcha which we input for verifying in Google and other websites that we are not bots. For that, he moved to AT&T’s Bell Labs in New Jersey where C++ programming language was developed by Bjarne Stroustrope… But the problem was that, although this A.I can recognize handwritings and help in other tasks, but it cannot recognize faces and objects in a picture, it can’t identify spoken words and understand the natural way people talk.